Commissioned in August 2014 by MIT’s Net Zero Energy Working Group and developed by Atelier Ten, an environmental design consultancy, the tool for the first time brings together a wide variety of data about MIT’s buildings—including age, square footage, program use, energy use, upgrade history, and whether the building is connected to MIT’s central cogeneration plant. The tool enables users to assess how upgrades in four key areas—lighting; building controls; heating, ventilation, and air conditioning; and building envelope (walls, roof, foundation)—are likely to affect the total greenhouse gas emissions produced by the campus. 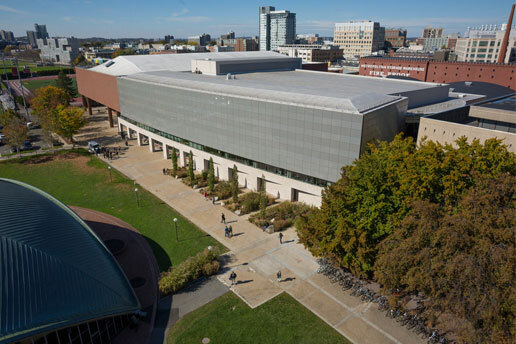 “This makes goal setting more realistic or evidence-based,” says Christoph F. Reinhart, associate professor of architecture, who served with Newman on the Net Zero Energy Working Group, an organization formed to shape MIT’s response to a Cambridge, Massachusetts, initiative to reduce the city’s carbon footprint. The term “net zero” refers to the goal of having buildings generate “net zero” greenhouse gas emissions—meaning that their energy consumption is perfectly offset by renewable energy production. A tool recently developed by Atelier Ten enables MIT planners to visualize campus energy use at the building level and in aggregate. This graph shows energy use intensity (EUI) for numerous campus buildings, highlighting the distribution of energy among chilled water, electricity, gas, and steam. The tool uses a statistical estimate of energy use for each building (shown as a detached gray line) to evaluate the effect of various energy efficiency measures on campus emissions. For example, much of MIT’s energy comes from its central plant, which is significantly more efficient in generating and distributing power than the electric grid. Therefore, MIT’s carbon emissions for every kilowatt-hour (kWh) generated on campus are lower than the same kWh purchased from the grid.